What’s in the CAE Speaking paper? 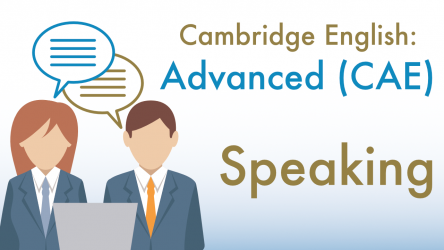 The Cambridge C1 Advanced Speaking test has four parts and you take it together with another candidate. There are two examiners. One of the examiners conducts the test (asks you questions, gives you the paper with things to talk about, and so on). The other examiner listens to what you say and takes notes. Practice the for C1 level with your Teacher at Skypeclass. Conversation between the candidates and the interlocutor. The examiner asks questions and you may have to give information about your interests, studies, careers, etc. The interlocutor gives you three pictures and asks you to talk about two of them. You have to speak for 1 minute without interruption and the interlocutor then asks the other candidate to comment on what you have said for about 30 seconds. The other candidate receives a different set of photographs and you have to listen and comment when they have finished speaking. The questions you have to answer about your photographs are written at the top of the page to remind you what you should talk about. 1 minute per candidate, plus a 30-second response from the second candidate. Conversation with the other candidate. The examiner gives you spoken instructions with written prompts which are used in a discussion. You have to talk with the other candidate for about 2 minutes (3 minutes for groups of three) about the written prompts. After the discussion time, the examiner will ask you another question which requires you to make a decision. You have 1 minute to talk together and make the decision (2 minutes for groups of three). Further discussion with the other candidate based on the topics or issues raised in the task in Part 3. The interlocutor asks each of you some questions and you discuss them with the other candidate.